Since the U.S. economy has been growing at a pace above what the U.S. Federal Reserve (the Fed) considers the long-term potential growth rate, we are closely following the evolution of Fed policy as economic growth slows. The Fed is expected to increase short-term interest rates on March 21, with the market projecting at least three 0.25% interest rate hikes this year. In general, rate hikes by the Fed tend to be deflationary, or at the very least, soften potential inflationary pressure and cause long-term interest rates to decline. In addition, slowing global economic growth momentum should also result in declining long-term interest rates. 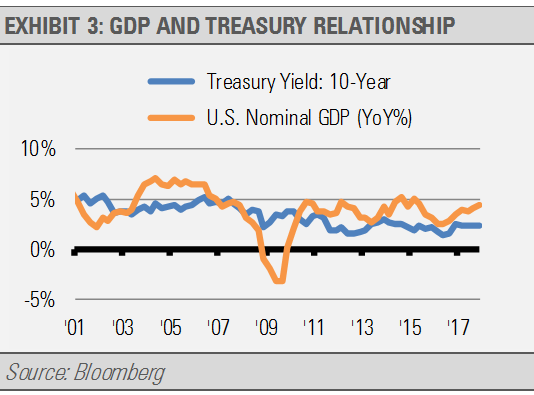 During the 2000s, the 10-year Treasury yield has averaged less than nominal GDP (NGDP) growth. As we expect NGDP growth to slip back towards the 4.0% area, we think the 10-year Treasury yield will fall back to the 2.5% area (exhibit 3). Our trigger finger is itchy as we watch the responses from the Fed and other central banks to the shifting economic environment. Our base case is that the Fed will not make a major mistake, which should allow the global economy to continue to grow. 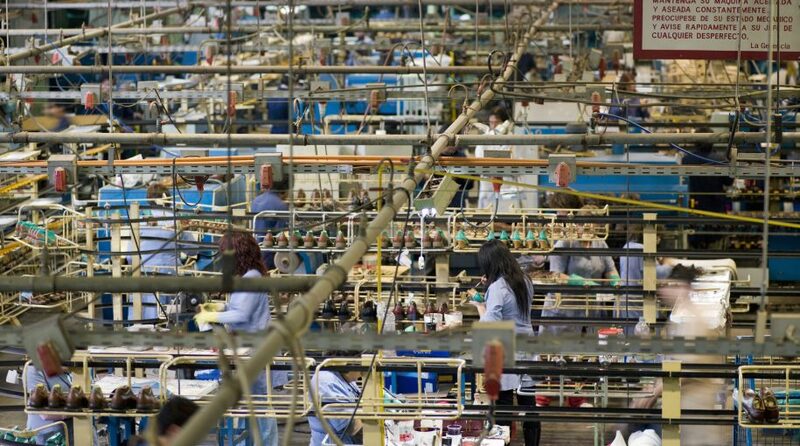 Economic growth leads to increase corporate revenue and earnings, which can ultimately support higher stock prices. We are prepared for more volatility and have shifted our Strategies to benefit from what we think will be a bumpy road to higher equity prices from here. This article was written by Gary Stringer, CIO, Kim Escue, Senior Portfolio Manager, and Chad Keller, COO and CCO at Stringer Asset Management, a participant in the ETF Strategist Channel. Any forecasts, figures, opinions or investment techniques and strategies explained are Stringer Asset Management, LLC’s as of the date of publication. They are considered to be accurate at the time of writing, but no warranty of accuracy is given and no liability in respect to error or omission is accepted. They are subject to change without reference or notification. The views contained herein are not to be taken as advice or a recommendation to buy or sell any investment and the material should not be relied upon as containing sufficient information to support an investment decision. It should be noted that the value of investments and the income from them may fluctuate in accordance with market conditions and taxation agreements and investors may not get back the full amount invested. Past performance and yield may not be a reliable guide to future performance. Current performance may be higher or lower than the performance quoted. The securities identified and described may not represent all of the securities purchased, sold or recommended for client accounts. The reader should not assume that an investment in the securities identified was or will be profitable. Data is provided by various sources and prepared by Stringer Asset Management, LLC and has not been verified or audited by an independent accountant.